Food Cravings Are So Hard to Resist...But Why? Are we brainwashed? Home » Food and Nutrition » Food Cravings Are So Hard to Resist…But Why? Food Cravings Are So Hard to Resist…But Why? Is it possible that both you and I have genetic conditions that pull us toward sugary, fatty foods? Or perhaps our bodies are simply conditioned to go after calorically dense foods? Are our loving parents or ancestors to blame for our food cravings? I don’t know about you, but chocolate calls my name. So do nachos. And pizza? It darn near screams it. Whenever I find myself in the same room with these items, I have a really hard time staying away. I even have to sprint past the pizzeria on the corner—sometimes it’s how I get my high-intensity interval training (HIIT) for the day! But seriously, though; cravings are tough to conquer. And those really are the three junk foods I crave the most. So when I come across research on the subject, my interest is more than peaked! Are We Brainwashed by Food Cravings? According to research both new and old, it’s entirely possible that the foods we often crave—you know, the super-sweet, fatty, and fried ones—are programmed into us. Older research has shown that cravings are a heightened motivation to eat directed toward specific foods—those that lead to surges in dopamine and make us feel good. Past research has also uncovered that there are sensors in the mouth and small intestine that detect glucose, fructose, fatty acids, and starch—especially where it’s highly concentrated (think all those foods you crave). And these organs send a signal to the brain to release dopamine. Positive reinforcement at its finest! Brand-new research, presented at the Experimental Biology 2017 conference in Chicago, is also showing genetic ties to food cravings. 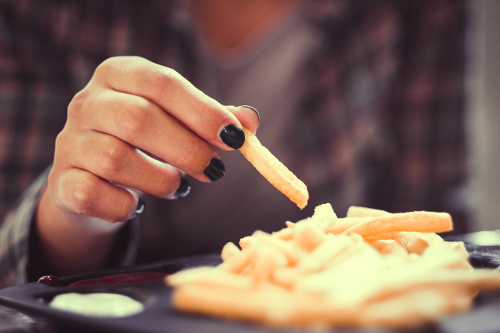 Spanish researchers recently identified genetic variants that make some people more susceptible to cravings than others. For example, chocolate lovers had variants of a receptor gene for oxytocin, the “love hormone.” People with the variant consumed more chocolate and had bigger waistlines. Chocolate is the most frequently craved food among women, and plenty of men go through hankerings, too. It’s a very highly concentrated form of sugar and fat, but it’s also got a habit-forming compound in it called theobromine. The theobromine gives it an extra kick when it comes to spiking dopamine, which is likely why chocolate bars are such popular treats. It should be mentioned that these gene variants are also associated with behavioral and psychological traits like stress, addiction, impulsivity, and depression. This all indicates that genetics may very well play a role in cravings. But that doesn’t let you—or any of us—off the hook. Now, I’d be lying if I said I don’t indulge a craving from time to time. But, for the most part, I’m able to keep it under wraps, and you can, too. One of the first things to do is get the subject of your food cravings out of the house. If that junk food is readily available, it’s too hard to stop thinking about or indulging in it. Quit buying frozen pizzas and ice cream, and empty out the drawer holding the chocolate bars. Next is to control the triggers. This might mean eating lunch at your desk, saying “no” to some social invites, or skipping certain aisles at the grocery store. This is a strategy you need to employ early on, until you’ve got things under control. After the cravings have subsided—and it might take a few weeks—you can start testing the waters to see if you can handle the triggers without giving in. Hill, A., “The experience of food craving: a prospective investigation in healthy women,” Journal of Psychosomatic Research. 1994 Nov; 38(8):801-14. https://www.ncbi.nlm.nih.gov/pubmed/7722960, last accessed April 27, 2017. Whiteman, H., “Are you a chocaholic? Your genes could be to blame,” Medical News Today, April 23, 2017; http://www.medicalnewstoday.com/articles/317049.php, last accessed April 27, 2017. Guyenet, S., “Where do cravings come from?” Examine.com, April 18, 2017; https://examine.com/nutrition/where-do-cravings-come-from/?utm_source=newsletter&utm_medium=email&utm_campaign=blog-041817, last accessed April 27, 2017.